Thanks, I’ll take a look. I’ve been meaning to see what’s on APBR for a while now, but it’s kind of fun coming up with stuff on my own first. Yes, I have seen that exact chart (in the thread/paper Evan linked to). It is an interesting subject, requiring some fairly intricate math. I have a question that I hope you can help me answer that is sort of tangentially related to this kind of thing. A lost of all in one metrics have a “break even” point. WP has a particularly high point which punishes players with middling efficiency put high usage like Carmelo Anthony. The justification for this is that his production, especially in late shot clock situations, can be replaced because the average TS% is around what he shoots at. So my question is this. Do you think its fair to say that any shot can simply be replaced by a league average efficiency? And are other factors raising the average TS% (I.E we cant always take a Ray Allen corner three or a Tyson Chandler dunk and high usage players like Durant, Lebron, and Kobe are disproportionately affecting the average TS%) so that they are obscuring what the true average of a “bad” shot is . I guess the question I’m really asking is can we find out what the average efficiency of a “bad” shot as well as the average TS% of a truly average player since I don’t think that is accurately represented by league average TS%. I’ve been reading through some articles here and find your analysis really interesting! I know this post is old, but in case you ever come back and look at this, I had a question about your analysis. The trend line definitely makes sense. The more time you have in the possession, the choosier you can be. But arent’t there other plausible explanations. For example, we might expect that a team that is poor offensively and/or facing a strong defensive team would have fewer points per first shot than average. That same team would also likely have fewer “good” shot opportunities per possession. 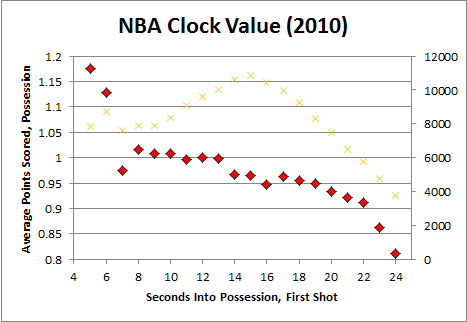 So wouldn’t it makes sense that those teams would find themselves stuck shooting late in the clock more often? Conversely, a good offensive team may be able to make it happen in the last few seconds of a possession, but, as a result of being good offensively, may just find themselves in that position much less often.